Glory to you, O God, Living One, Word and Spirit. Now and for all ages and eons. Amen. Grant us the light of Your grace. Amen. From Your Fullness, we have received grace upon grace. Light and truth have come through Jesus Christ, Your Holy One. Bring us near to Your heart, O God. Amen. When we abide in Love, we abide in God and God in us. Let us love one another. Amen. 1. The First Sign: Water into wine. God is light. In God there is no darkness. Let us walk in light, in union with one another. Think of the love that God has lavished upon us by letting us be called God's children, for that is what we are. O Beloved Disciple Saint John, who rested thy head upon the breast of the Savior, and received into thy heart and home Holy Mary, the Mother of Christ, we implore thee ot intercede for us with the Heart of Jesus, to fill our hearts with light and love, generosity and compassion, and to set our hearts free from all earthly craving; so that we may live as sisters and brothers of Jesus, sustained by the Holy Spirit, in union with God, for all ages and eons. This chaplet prayer is a meditation on seven signs or manifestations of the Christ, which scholars suggest form one of the sources of the Gospel of John. The signs not only point to the meaning of the life and ministry of Jesus, but are also portals for entry into the deeper mystery and knowledge of the inner meaning of the Christ event. 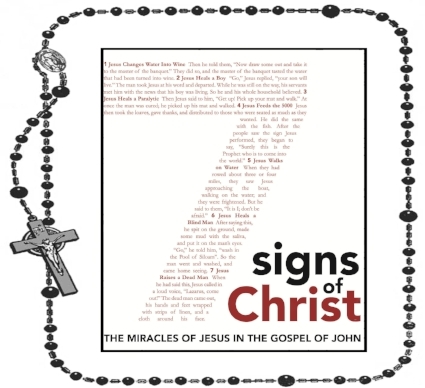 The reconstructed “Signs Gospel” provides a different order and number for the signs than Canonical John. In all, there are 22 sections to the reconstructed gospel, which may relate mystically to the 22 letters of the Hebrew alphabet, and each one can be prayed as a mystery of Christian Qabalah, to enter into the higher mysteries of God.